Recycled plastic can also be used to manufacture innovative products; among them, Fiberon® composite decking. In the last two years, Fiberon has taken more than 120 million pounds (that’s 60,000 tons) of unwanted plastic and turned it into beautiful decking, railing, and fencing. Even the location of the recycling facility helps reduce our environmental impact. 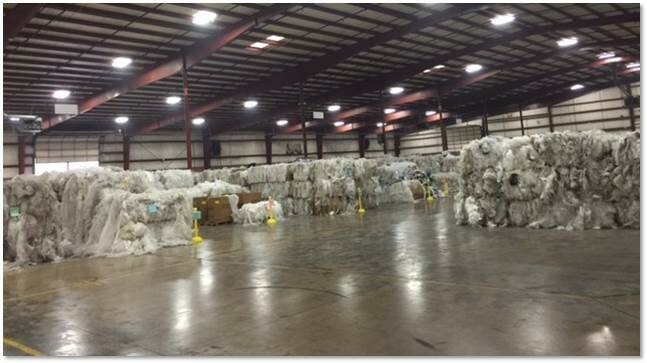 Fiberon Recycling sits less than three miles from our New London, North Carolina manufacturing plant. This added bit of efficiency means less fuel is consumed by our trucks and less CO2 is emitted into our atmosphere. Upon its arrival, the polyethylene must undergo a battery of tests, including thermal, moisture, and infrared analysis. These tests will confirm the molecular structure of the polymers as well as give our team insight into the history of that specific sample. Our inspectors look at the individual physical properties of the samples, check for possible degradation, and determine whether any contaminants are present that might have been incorporated during prior manufacturing processes. If the samples meet strict Fiberon quality requirements, they are staged in the warehouse, where they will undergo further inspection. If the samples fail, they are sent to alternate recycling operations with less stringent requirements. Nothing is wasted. At this point, our team creates batches or “recipes” from these materials. By blending together plastics of varying characteristics, we are able to further hone the quality of what we produce. The bins containing pre-shredded materials (detergent bottles and milk jugs) are fed directly into the extruder. 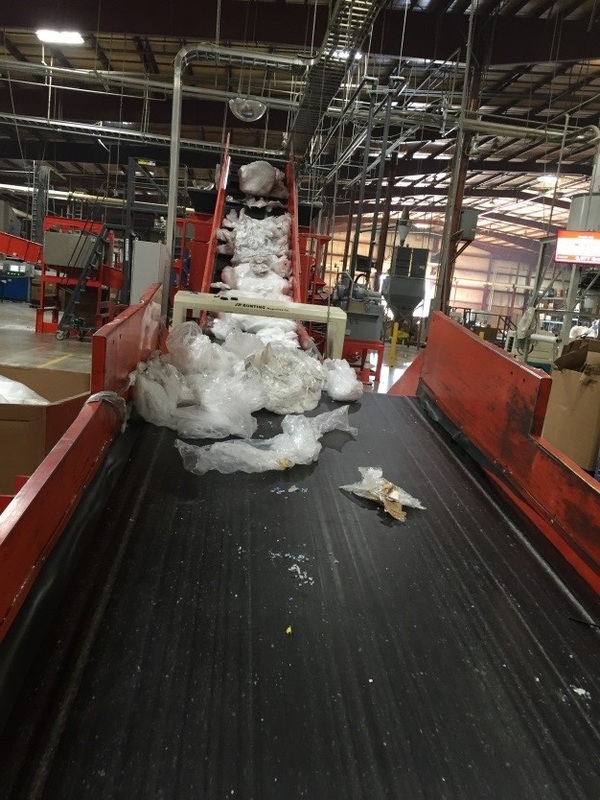 The bales of plastic film and bags must be opened and loaded onto conveyor belts by Fiberon team members. The bales are loaded in layers, where they can be inspected once again for any hidden contaminants. The material then travels through a metal detector, then the shredder, and finally, through one more metal detector before reaching the extruder. This extra step protects the machinery and helps ensure that no metal contamination could feasibly make it beyond this point in our process. Layers of plastic must pass through a metal detector before entering the shredder. Upon entering the extruder, the material is melted by the torque of a very large screw. The molten plastic then passes through a screen filter into the barrel of a second, similarly-sized screw. Finally, the melted plastic travels through one more screen before being forced through a small orifice die where a rotating blade, spinning at speeds in excess of 2000 rpms, cuts the strands of the molten plastic into pellets. The pellets are then cooled by water, and sent through a system of ducts to an outdoor blending silo. Here, the pellets from multiple extruders are mixed together to ensure consistency among the thousands of pounds of pellets we produce in a single work day. Recycled plastic. Reclaimed wood. No felled trees. 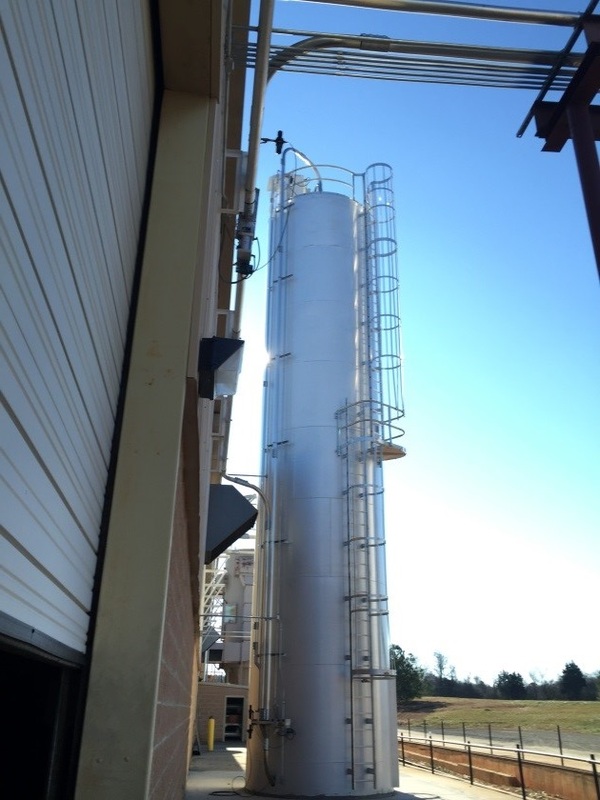 Having completed the recycling process, the blended pellets are then transferred to a large storage silo. Here, the materials will await delivery to our nearby manufacturing facility or will be loaded onto rail cars for shipment to our second manufacturing plant, located in Meridian, Idaho. 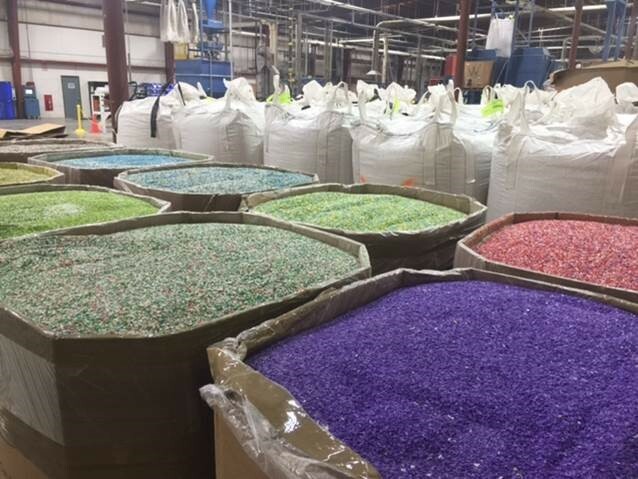 Of course, these plastic pellets are only one example of recycled content comprising Fiberon decking. Wood flour (ground-up cabinet pieces, door frames, and similar lumber scraps) is the other key ingredient in the eco-friendly mix. During manufacturing, these raw materials will be blended and then co-extruded with a durable outer layer that ensures resistance to moisture, weather, insects, and decay. All told, Fiberon products comprise 94% recycled content. What’s not in the mix? Lumber from freshly cut trees. All of our wood is post-industrial wood waste. 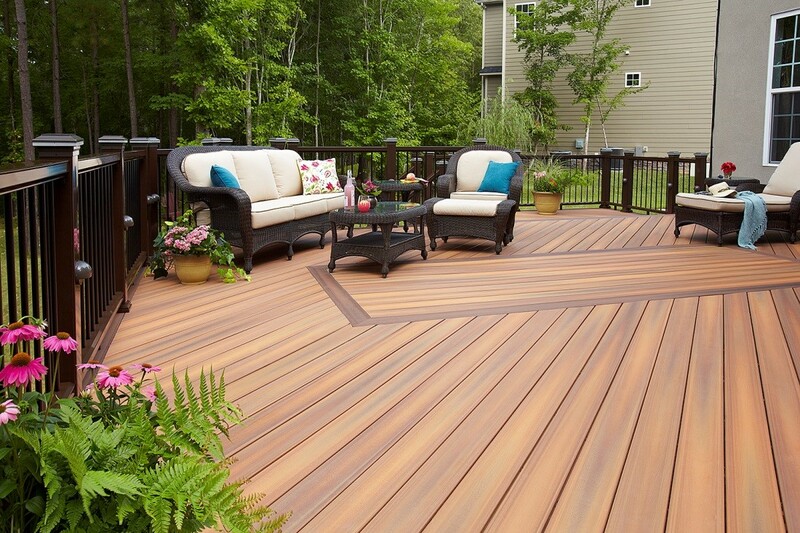 No tree is ever felled to make Fiberon Decking. 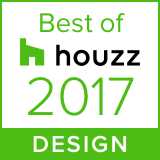 So if you’re the not-so-proud owner of a not-so-sturdy wood deck, consider upgrading to long-lasting, great-looking, and very eco-friendly Fiberon composite decking. Check out these awesome projects, and see what you’ve been missing.